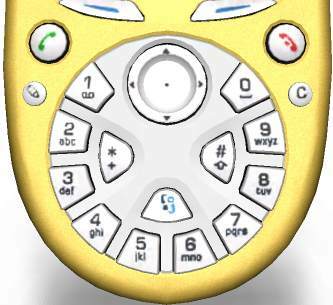 This was an April 1, 2002 spoof photo of an "all digital" cell phone that I posted as an April Fool's joke for members of the ATCA and TCI telephone clubs! After all, rotary dials produce "digital" signals and not analogue signals produced by touch-tone dials. Ironically, in October 2002, Nokia announced this new model which sports what looks very much like a rotary dial! Must be a nostalgia model for those that remember using rotary dial phones when they were growing up. Click on the dial in the photo above to see enlarged view of dial. Bell Labs has an EXCELLENT series of web pages on wireless technology at http://www.bell-labs.com/technology/wireless/. Please visit their web site for some easy to understand information and fun graphics on wireless technology history and technology. The intent of this page is to provide some additional information not covered by the interactive Bell Labs website above. As an example of this, a lady in Australia contacted me with a question about why Canada and the USA don't have compatible cell phone system with the rest of the world. Her daughter, who was visiting North America, told her mom that she was unable to make cell phone calls while visiting in North America. The answer for this lady is somewhat complex but the good news is that this will not be a problem in the near future. It has to do with different technical standards and frequencies of operation between North America and the rest of the world. I received some answers from members of the telephone clubs of which I'm a member. I live in Australia. Our daughter is currently traveling in the USA on the final leg of an around the world holiday. Whilst she has been in every other part of the world she has been able to use her cell phone to speak or send Text messages, as we have been able to do to her. Can you please explain to me why USA and Canada are the only 2 countries out of the dozens she has been to where she can't use her cell phone? I must say, it has been a huge inconvenience. Looking forward to your reply. Thanks for your very prompt reply. <snip> It really is a bit baffling that the States and Canada are out of step with the rest of the world in this regard. "The 8 kHz sample width TDM digital audio that handles all of the serious work these days is different in USA/Canada and most of the rest of the world. We use "mu-Law" (North American companding standard used in conversion between analogue and digital signals in PCM systems) and they use "A-Law" (A companding method for encoding-decoding audio signals in 30channel pulse-code-modulated (PCM) systems. A-law is the primary method used in Europe.) A transcoding happens at international gateways. The digital hierarchy is completely different as well. We in North America build up everything based on multiples of 1.544 mbps (Ds-1 or T1) whereas they (non-North America) use multiples of 2.048 mbps (E1). We are mostly compatible at the DS0 levels (64 kbps) but even there in the USA/Canada there are still older "robbed bit" T1 that are not 64 kbps. Even today, the AT&T "does not play well with others". ISDN PRI (primary rate ISDN) offered by AT&T is not compliant with Bellcore standards nor the the older Lucent/AT&T standards. For more info, see http://cellphones.about.com/cs/basics/. If anyone would like to contribute to this web page, please contact me. I generally do not post other people's email addresses on my website due to spamming problems that can occur from publicizing such information.